Today, as we continue in our journey of seeing how the big story of the Bible impacts our lives, we are talking about marriage. We started two weeks ago with work because that was one of the first things Adam encountered after he was created. And then last week we jumped ahead in the story and talked about money and possessions, mostly because that is so connected to work for us today. But now we’re going back and loosely following along as these themes appear in the story. And as we’re going to see today, marriage was the very next major life event that Adam and Eve encountered. And so that’s why we’re here today. I don’t think I need to say much more than that by way of introduction. We all know that marriage is a big deal. We all know that marriage is important. We also all know that marriage is difficult. It’s hard to do well. And in general, marriages and marriage itself is not doing so well in our world today. And so I hope that nobody here needs to be convinced that it’s a good idea for us this morning to listen in on what God has to say about marriage. And as we survey marriage in the big story of the Bible, I think that each one of us—whether we’re married, were married, or have not been married—will find something important for us to take home and apply. So our first stop this morning as we consider what the big story of the Bible has to say about marriage is Genesis chapter 2. We spent time in this chapter two weeks ago, when we heard how the Lord God created Adam, and then “put him in the garden of Eden to work it and keep it” (Genesis 2:15). And so God performs the very first surgery. He knocks Adam out and creates the first woman, not from the dirt like Adam, but from the side of Adam himself. And when he meets her for the first time, he says, “at last” (Genesis 2:23). There’s a couple of things I want us to notice right away at this point in the story. First thing: did you see how God did not create Adam and Eve as a married couple and then give them work to do? The mission of working and keeping the garden came first. And after that, God created Eve, because Adam wasn’t able to do this job on his own. He needed a helper to be able to fulfill the work God had given him to do. From the very beginning, marriage was never an end unto itself. Marriage was about the mission. I highlight this because it’s common for many people, even many Christians, to view marriage as an end unto itself. The life goal of so many people is just to get married, and what comes after that is a whole lot less important. But that’s not the way God designed things. The mission that God gave Adam was the most important thing, and marriage was created to help that happen. The second thing we should notice here is that romantic love is not the ultimate purpose of marriage. Isn’t it true that it’s very common for us to view marriage as the culmination of romantic love between two people? That’s why “fall in love and get married” is a phrase that doesn’t sound strange to us. It’s what happens in all the movies, all the “Christian” romance novels. It’s why so many weddings these days are just big celebrations of romantic love. But God did not create Eve because Adam needed a little romance in his life. God didn’t say that He would make a lover fit for Adam. He said that He would “make him a helper fit for him” (Genesis 2:18). According to Genesis 2, the main purpose of marriage is not romance, but work. Marriage is about the mission. And I believe one reason so many marriages today are struggling and failing is that people have forgotten this. Far too many people build their whole lives on the goal of getting married, and when marriage turns out to be less exciting then they were expecting, they just get a divorce and find someone else to fall in love with. We’re going to say some more about this at the end of the message, so I’ll leave it at that for now. But don’t miss the point that that marriage is about the mission. Let’s look now at verse 24, which comes after Adam met Eve and named her “Woman.” It says, “Therefore a man shall leave his father and his mother and hold fast to his wife, and they shall become one flesh” (Genesis 2:24). This verse is really important, because it tells us that what God did with Adam and Eve wasn’t just a one-off. Instead, He was establishing a pattern for others to follow. He was creating the institution of marriage. This is why courts and governments and even churches don’t get to redefine marriage. It was never theirs to define in the first place. This was God’s idea. Now look at verse 24 more carefully. It tells us that when a marriage takes place, there’s two main things that need to happen. First, each person leaves their families. I always wince when I go to a wedding reception and hear the phrase “welcome to the family.” That’s not biblical. When two people get married, they are not joining each other’s families. They are leaving their families to start a whole new family unit. The second thing we see in verse 24 is that a husband and wife hold fast to each other. That might sound like a long hug, but “hold fast” a phrase that’s used elsewhere in the Old Testament to talk about being faithful to someone within a covenant (Deuteronomy 10:20). And so this phrase helps us to understand that marriage is a covenant. When I do remarriage counselling, I ask the couple what the most important part of their wedding day is. And the right answer is the vows. When they pledge, in front of witnesses, to be faithful to each other no matter what until they die. It’s those public covenant vows that actually make them married. There’s one more thing to notice from verse 24: a man and his wife are united in a covenant, and then—and only then—do they become one flesh. This helps us understand the Bible’s teaching that physical union is a reenactment and a reminder of covenantal union. And this is why the covenant of marriage must always come before physical intimacy. Physical intimacy outside of this covenant is not just wrong, it’s unthinkable—or at least it should be. There’s so much more that we could say here, but I trust this gives us a little picture of God’s design for marriage in creation. Now let’s move on to the next big event in the storyline of the Bible, which is the fall. We don’t have to look very far to see that the fall of Adam and Eve into sin caused devastation to everything in their lives, including their marriage. You remember in Genesis 3 how God pronounced words of curse on Adam and Eve for their sin. And a part of what He said to Eve is in verse 16: “Your desire shall be contrary to your husband, but he shall rule over you” (Genesis 3:16). Adam having authority over Eve wasn’t a new idea. That was in place before the fall, as seen by the way that he names her, for example. But after the fall, that whole relationship and authority structure will be shot through with tension. Sin causes marriages to become power struggles, war zones of conflicting desires. Sin causes marriages to become tense and painful and loveless. Sin causes couples to break their covenant vows and be faithless to each other. Sin makes marriages end. Some of us don’t need to look very far to witness the destruction of marriage because of human sin. My parents split up when I was eight and divorced when I was twelve. I know that many of you have seen or experienced varying levels of pain because of difficult marriages. We all know what this is like. And so, we need Jesus. We need the fresh breeze of the New Creation to transform the way that we understand marriage, think about marriage, and do marriage. We read Ephesians 5:22–33 together a few minutes ago, and there is so much in this passage that shows us the way that marriages are transformed and redeemed in Christ. But for the sake of our time together this morning, we’re just going to focus in on one key theme. And it’s this: in Christ, we discover that marriage is about something so much bigger than just two people. Marriage is actually all about Jesus and us. We see hints of that from verse 22 down to 30, where husbands are called to emulate Christ, and wives are called to emulate the church. There’s a connection here between marriage and Christ’s relationship with the church. And then he says in verse 32, “This mystery is profound.” Now, stop right there. When you hear the word “mystery,” what comes to mind? In English, this word usually means something that’s hard to understand or which nobody knows. But in the New Testament, in the Greek language, this word refers to something which was once hidden, but now has come to light. That’s why Paul often speaks of the “mystery of Christ” (Ephesians 3:4). It doesn’t mean that Jesus is hard to understand, but rather that the truth of Christ was once hidden in the shadows but has now become visible and plain. And so Paul is saying that Genesis 2:24 is a mystery. These words about a man and a woman holding fast to each other speak of a truth which was once hidden but is now out in plain sight. Just think about what this means: all the way back in the garden, when God designed marriage, He was already thinking about Christ and the church. And when He inspired these words in Genesis 2:24 about a man leaving his home to come and hold fast to his wife, He was actually talking about Jesus, who would come from heaven to seek and save give Himself up for His bride to and purify her name make her beautiful and who would holding fast to her in covenant faithfulness. This is telling us that God intentionally created human marriage to be a little picture, a little reflection, of Christ and the church. And so we shouldn’t be surprised to get to the end of the Bible, and see it finish up with a marriage. Revelation 19 speaks about the great marriage of Christ. Revelation 21 tells us about the “new Jerusalem, coming down out of heaven from God, prepared as a bride adorned for her husband” (Revelation 21:2). It’s this big story that helps us understand why human marriage will not exist when we get to the New Creation. See, many people—especially newlyweds—have been deeply saddened when they’ve read Jesus’ words in Matthew 22:30: “in the resurrection they neither marry nor are given in marriage, but are like angels in heaven.” It sounds like we’ll really be missing out. But we will not be missing out. We will not need marriage in the New Creation because we will be fully experiencing the reality of which marriage was only a picture. Marriage is a baseball card, and we’re not going to miss it when we get to fully experience the real thing. So that’s where we are in this biggest story ever told. We are the bride, and we’re waiting for our groom. And we look to the day when human marriage will pass away and be fully replaced by the real thing. But today, in this season of already-but-not-yet, human marriage hasn’t been done away with yet. Christians still get married. Many of you are married. So what does the big story of the Bible say about our marriages here and now today? I want to suggest that when we step back and survey everything we’ve seen today, there’s three big ideas that come to bear on each of us today, whether we are married or not. First, we all need to remember that marriage has always been about the mission God gave us to fulfill. And like I said earlier, we need to stress this, because many Christians have been swept up in the way that our culture worships romantic love, and worships marriage as the culmination of that romantic love. I just think about all of those Christian romance novels about two unrealistic people falling head over heels in love with each other and getting married. There are very few novels being written about already married couples staying married through a hard season. That’s the kind of story we need more of. These cultural blinders impact the way we read the Bible. Think about the story of Ruth for a moment. Almost every single preacher or author I’ve ever heard talk about that story turns it into a romance between Ruth and Boaz. Where they fall in love and have all of this chemistry. But none of that is actually in the Bible. We really need to recalibrate here. Now please understand. I’m not against romance. Speaking personally, romance is a wonderful part of my relationship with my wife. I fell in love with her on Christmas Eve 2009, and stayed up late that night writing lame poetry for her. But by that point, I had already begun to realize that she was the kind of person that I could serve Jesus with more effectively than I could on my own. And even after that point, I didn’t just follow my heart. I remember one specific conversation we had as things were getting more serious. And I asked her, “If we get married, and God calls me to do ministry in a really hard part of the world, would you go with me?” And if she had said “no,” we would have been finished. Because my life was about serving God, and I wasn’t going to sacrifice my life’s mission just because I fell in love with the wrong girl. I remember a missionary friend once warning me in the most solemn tones not to marry the wrong person. And he told me about how many young men he had seen get all fired up for Jesus, and go off to Bible college so that they could become a missionary, only to fall in love with someone there, and get married, and settle in to a comfortable suburban lifestyle, all the while being cheered on by a church culture that prizes marriage above almost everything else. And I was determined to not let that happen. So while I thoroughly enjoyed falling in love with Aimee, there was a lot of hard work and deliberate conversations with her and with others before I asked her to marry me. So young people, please listen up: never marry someone just because you’re in love with them. That’s like buying a restaurant just because you like the food there. You need a lot more in place before you make a massive decision like that. Never marry someone unless you know, and the wise and mature people around you know, that you will be able to serve Jesus more effectively with that person than you would without them. Now a word to those of you who are already married. Just like getting married is not about falling in love, so staying married is not about staying in love. Many couples, when they fall out of love with their spouse, give up on their marriages. Some get a divorce. Others just stop caring and stop working and stop trying. But please hear this morning: there is so much more to being married than being in love. Not that there’s anything wrong with staying in love or cultivating romance in marriage. Once again, I can testify here. After the better part of a decade, I am still completely bonkers about my wife. She can sometimes just look at me and reduce me to a drooling fool. We really, really like each other. Just the other day she was in the kitchen and I walked up towards her and I’m pretty sure I heard our daughter making kissing noises, because she knew what was coming next. But we don’t feel those romantic feelings all of the time, and that’s OK. We understand that romance is the gravy. The meat and potatoes of our marriage is our commitment to helping each other serve Jesus and others more effectively. And romance is just the gravy that goes on top if that meal that helps it all taste so much better. And you know what? You can eat meat and potatoes without gravy. It’s not as fun, but it’s possible. And it’s a lot better than having just gravy and nothing else, or worse, gravy on top of something terrible like rotten meat or roadkill. So if you’re married today, whether or not you still feel in love, the most important thing you can do for your marriage is to make it about the mission. Use your marriage to serve each other so that you can serve Jesus and others as effectively as possible. And what you’ll probably find is that recalibrating your marriage to make it mission-focused will make it a lot more fun and maybe make you fall in love again. All of this is our first point of application. Marriage is about the mission. The second thing we all need to remember is that marriage is about Christ and the church. Marriage is about the gospel. If you are married, a major part of your mission is to so love and respect each other that you give the world a living, breathing picture of what Jesus and the church are like. And the way we start to do that is by obeying the commands of Ephesians 5:22-33. Husbands, I hope you know you have the bigger responsibility in this department. The buck stops with you, and it’s your job to so love your wife that other people see your marriage and say “If that’s how Jesus loves His church, I want in.” Make your marriage preach the true gospel by loving your wife well. Wives, you live out the gospel in your marriage by submitting to your husband, and respecting him. I understand that much of the time, this doesn’t come naturally. Your husband is not always respectable and deserving of your respect. But that’s the whole point. God tells you to submit to and respect him not because you feel like it or because he thinks he needs it, but because your marriage is not about you: it’s a picture of Christ and the church. So think about how you talk about your husband in front of your children, or to your friends when he’s not around. Do you complain about him or belittle him or roll your eyes? If you do that, what does it say about the gospel? What sort of picture of Christ and the church are you portraying? And at this point I just want to add that I know marriages are hard and they take a lot of work. They need a lot of regular maintenance. And often what can really help with that is some input and perspective from others. That can take many forms, but I just want you to know that there is no shame in sending me a note and coming to sit down and talk about your marriage. Even if your marriage is good, and you want to make it better, that would be a great thing to do. For all of us in the room today, married or not, the third truth we must remember is that marriage is not ultimate. Marriage is not permanent. 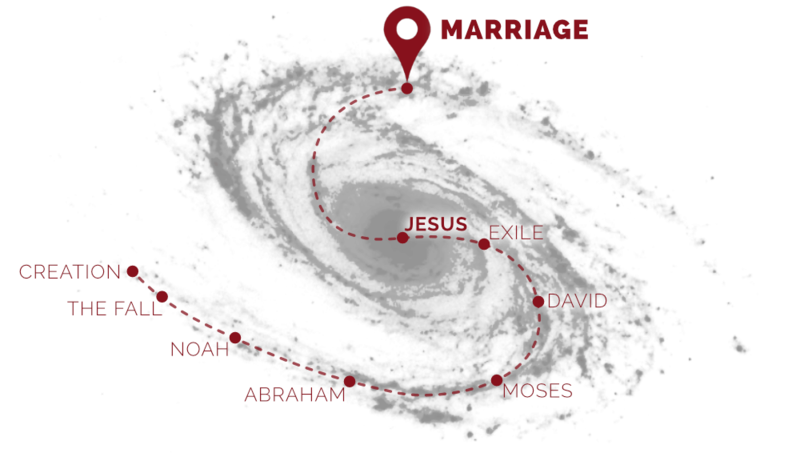 Marriage is just one way that some people get to glorify Jesus with this stretch of their life. But if you know Christ, then if you are married or not, you are a part of the reality to which marriage only points. And that’s a truth we’re going to pick up on more next week when we talk about singleness, which is another way that some people get to glorify Jesus with their life. And what the big story of the Bible has to say about singleness might really surprise you. But we’re going to end today by singing a wonderful song that celebrates the reality. As the church, we are the bride that Jesus came from heaven to rescue. We are all a part of this wonderful, eternal relationship, where there will be no death to do us part.